The main framework of the mediaeval settlement on the Kluczbork Land was associated with the broad migration of the second half of the 13th century. Then, three towns of this subregion received civic rights, namely Wołczyn in 1261, Byczyna in 1268 as well as Kluczbork - the so far marketplace settlement - received the location document from Henryk IV Probus in 1274 becoming the main business and administrative centre of the Kluczbork Land. The court located here was the body of appeal for the residents of the villages, appealing against the sentences of the rural courts. The rural settlement on these areas also reaches the 13th century, e.g. Chocianowice establishment followed already in 1213, Laskowice in 1239 and Małe and Wielkie Lasowice in 1292. 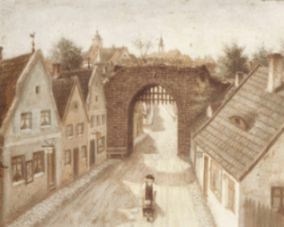 The following years is the period of a systematic town development, despite numerous changes in owners of the Kluczbork Land donating towns, as an inheritance or a collateral. Between 1341 and 1356, for a short time, Kluczbork, Byczyna and Wołczyn became the property of the King Kazimierz Wielki, which gave the Kluczbork Land to the Czech King Karol II in exchange to the Warsaw Duchy. To sum up, the Kluczbork Land was in possession of the Piasts of the Brześć line (Polish dynasty of kings) for the longest time until their disappearance in 1675.
a target of attacks of Anti-Hussite forces, systematically trying to conquer the town. As the attempts were not successful, negotiations started and for the money equivalent, Byczyna and Kluczbork were bought back from the Hussites in 1433, Wołczyn however remained in their possession until 1436, then it went to the Dukes of Oleśnica permanently. The Dukes of Opole ruled in Kluczbork and Byczyna, finally thanks to the Ferdynand I's efforts, Kluczbork together with Byczyna returned to the Brześć Duchy staying there until the house disappeared. During the reign of Fryderyk II and Jerzy II, the development of the Reformation followed on these areas. Despite the initial resistance from the Crusaders related with the town with the Red Star as well as the townsfolk, the evangelical religion started to broaden up, the both churches in Kluczbork were given to evangelists. Special schools for the Polish pastors were opened in Wołczyn and Kluczbork. As a result, the residents of Kluczbork became faithful to Lutheranism in the following years. Apart from the religious atmosphere, the Reformation also influenced the life of the town: the power of dukes became stronger at the expanse of the local government. on several occasions. Just after the war, the region had a chance for development. The Westphalia Peace (1648) granted the Brześć and Oleśnica Dukes , thus the whole Kluczbork Land, a freedom of profession of the Augsburg faith. As a result, Kluczbork became a cultural centre of the Polish protestants settling here and in other surrounding villages of the persecuted Arians. This is also heydays for the grammar school in Byczyna, famous for its high level of education. After the death of the last Brześć Duke, Kluczbork and Byczyna went to the house of Habsburgs, yet in 1742 together with the whole Upper and Lower Silesia went to Prussia. Despite the following Silesian wars, the situation did not change. Finally, the Kluczbork Land remained under the German reign for almost 200 years. 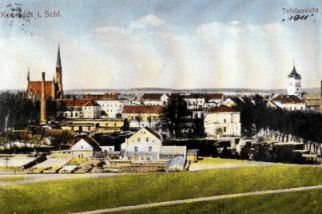 Kluczbork and Byczyna as the royal towns, however Wołczyn – the property of the magnate house of Posadowski was a private town until the system reform of Stein and Harden berg initiated in 1807 and crowned with the new administrative division, which since 1816 made Kluczbork a county town. Byczyna and Wołczyn were incorporated to the county next to the rural communes. The borderland location of the Kluczbork County had a negative impact on its development, the situation improved a bit thanks to the construction of the railway line - the first section: Oleśnica - Namysłów- Kluczbork -Fosowskie in 1868. All in all, the county remained a traditional agricultural region with poorly developed industrial infrastructure until the interwar period. Although, in this period the first plants emerged, presently operating: in 1893, the yeast factory was established - the today Lesaffre Bio Corporation from Wołczyn, or the metal factory established in Kluczbork in 1905, presently "Famak" Machinery and Equipment Factory. a borderland area and a considerable exchange in population followed. However already in April, the County Township in Kluczbork followed, which undertook an initial administrative division of the Kluczbork Land and the final division was approved with the decree of the head of the „Śląsko-Dąbrowskie Province from the 27th of November 1945 and was binding until 1975. The Kluczbork County regained its position in 1999 including four communes, namely Byczyna, Kluczbork, Wołczyn and Lasowice Wielkie.